Caraway is best known as the crunchy seeds atop dark rye bread but this familar kitchen spice is also one of the best herbs to prevent gas and bloating. Caraway is also a good remedy for colds and congestion, it contains mild antihistamines, antimicrobial compounds that help to relax the muscles that cause coughing spasms. 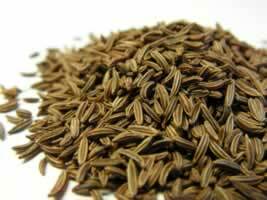 Caraway seeds are also used in a number of medicinal preparations for treating disorders such as rheumatism, eye infections and toothaches. Caraway seed oil is used in treating fungus infections as well, and is effective against candida infections. Caraway is often used in combination with peppermint oil to relieve the symptoms of irritable bowel syndrome and indigestion. Caraway oil has a strong, warm, sweet-spicy odor, and blends well with other spicy oils. In the Kitchen: The roots may be boiled and treated like cooked parsnips or carrots. The young leaves can be used in salads or for seasoning soups and stews. The licorice flavored seeds give rye bread its characteristic taste. They are also good in potato soup, cheese spreads, sauerkraut and salad dressings. Caraway Side Effects: If you have a kidney problem, be careful with caraway. 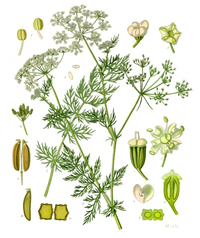 Caraway is a member of the carrot family. It has tiny white or red tinged flower clusters. Each "seed" is half of a caraway fruit which is used whole or ground in cooking and herbal medicine. All parts of the plant are edible, roots, leaves and seeds. Native to Africa, it now grows wild over most of North America.